The EcoSEC GPC system contains two independently operating pumps. The main pump delivers solvent to the column. 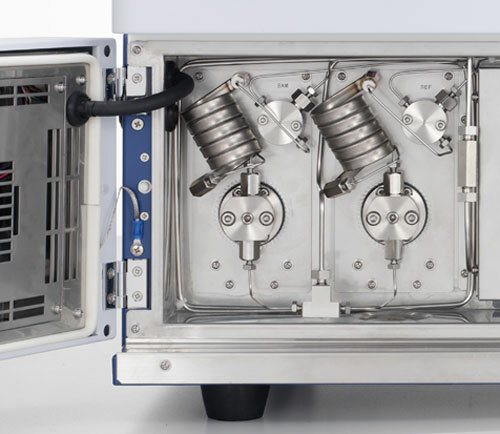 An identical secondary pump delivers the same solvent via a 'reference column' to the reference cell of the refractive index detector. The primary benefit derived from the second pump is an improvement of RI baseline stability. Baseline stability is essential for the accurate calculation of polymer molar mass averages. For example, computer simulations predict a polymer with a polydispersity index (PDI) of 5 will have an 18% error for Mz if baseline instability leads to a 4% error in peak width determination. In addition, a 2% uncertainty in baseline height will result in a 20% error in Mz. A study was done to demonstrate the superb baseline stability of the EcoSEC GPC System compared to that of two conventional GPC systems using both 15 cm and 30 cm columns over a five hour time period. 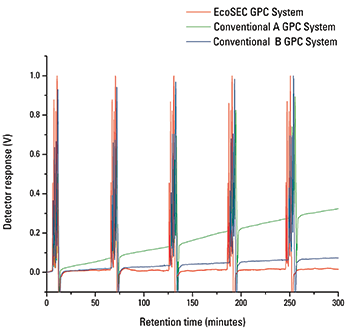 The figures below demonstrate that the EcoSEC GPC System maintains the efficiency of semi-micro columns and maintains a stable RI baseline when both conventional and semi-micro GPC columns are used. 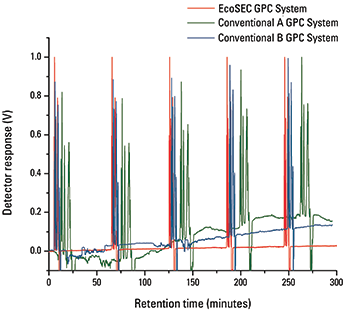 As shown in Figures 1A and 1B, five consecutive injections of polystyrene standards with run times deliberately extended to one hour without auto zeroing the detectors between injections, resulted in an extremely stable baseline with low baseline drift on the EcoSEC GPC System and a significantly drifting baseline on the two conventional GPC systems. In comparison to the conventional GPC systems, the EcoSEC GPC System has both a lower baseline drift and a better signal to noise ratio. As an added benefit, the secondary pump may also be used in a column switching mode (optional) to allow for a quick change-over from, for instance, a high MM column to a low MM column. All components shown in the picture can be maintained at a constant temperature within the range of ambient plus 10 °C to 50 °C upon closing the cover door (left).